A car blow a tire and manage to not swerve into any cars while pulling over onto the shoulder. A car in the left shoulder facing the wrong direction — it had spun probably a minute prior. A tow truck hauling a pickup truck backward (trucks have rear-wheel-drive so the free wheels are the front) and, due to the speed of freeway travel, the bed liner of the pickup and all the contents literally lifted off the bed and floated in the air before slamming onto the roadway directly in front of the trailing traffic. Large wood chunks (debris) in the middle of the lane. Half a dozen near misses of trailing vehicles nearly rear-ending the vehicle they were trailing. I’ve driven to work for 12+ years now on various roads and don’t remember this many traffic issues in so short a time. Perhaps the roads are getting more dangerous, or perhaps I’m just more aware. Regardless, I am grateful I haven’t been involved in any of these observed incidents. On to better news: Austin turned 4 on Saturday. This kid is such a joy to have around and everyone seems to love him. He flirts with the teenage girls, plays with the teenage boys, gives his momma just enough snuggle time to melt her heart, and offers his help when I’m doing a project. He’s often found approaching someone and asking, “Do you want to play with me?” He had a great birthday and was so genuinely happy, grateful, and delighted with everything that happened on his big day. 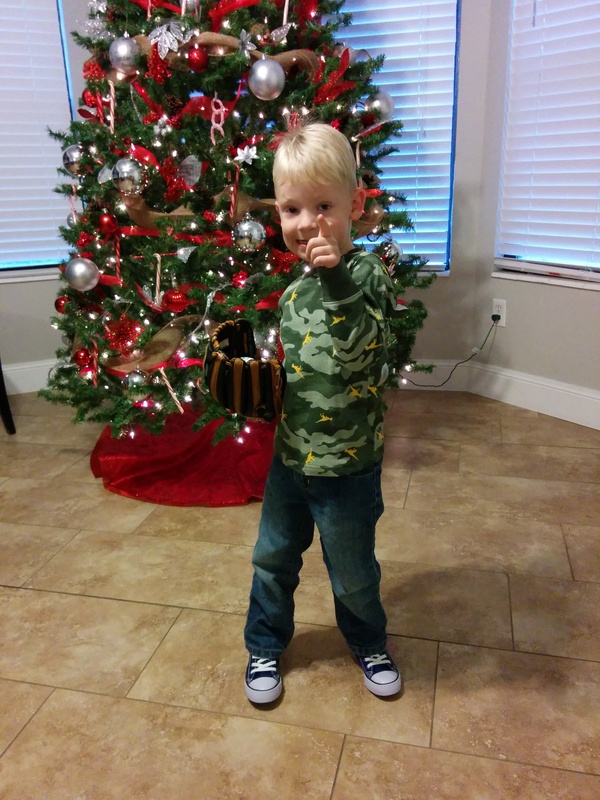 The new 4 year old wearing his new kicks and shirt and holding his new (left-handed) baseball mitt. We sang to him (like 5 times during the day) but he had some fun with the candle before telling us what he wished for. See the video. Jen also got him a Nebraska Huskers hat — he’s apparently had a fascination with them for a while now. While I served my LDS mission in Nebraska, we don’t openly cheer for the Huskers or have any other memorabilia hanging around the house. But he was delighted to get his hat. See the video. Fall here has been spectacular, although we’ve had a bone-dry October. Our secondary water was turned off Oct. 5 and our lawn could have used a few waterings since then. However, I don’t have any interest in using culinary water for that at this house, so I just let the brown spots appear. I’m pretty sure it — and I — will survive. 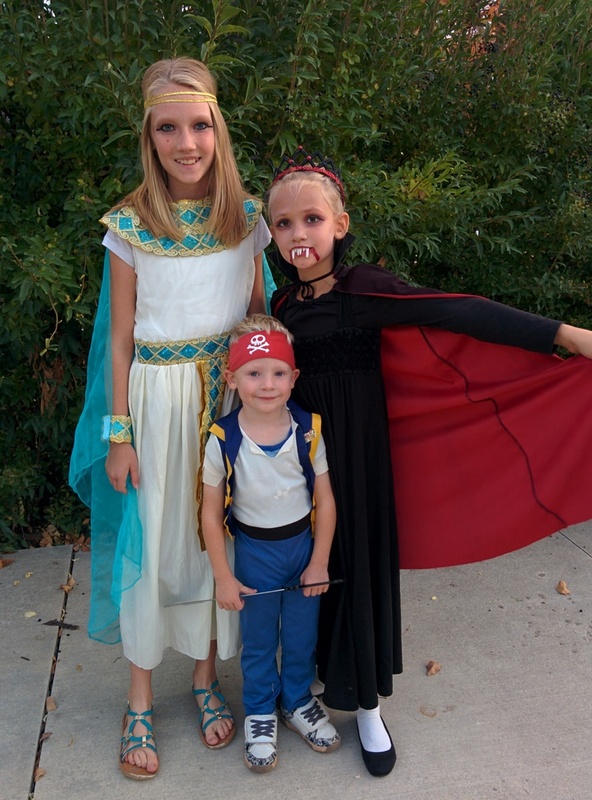 The mild Fall meant we had a very enjoyable Halloween. The kids didn’t even wear jackets under their costumes and came home with a bunch of loot. Although I actually have 4 kids, and although all of them dressed up and begged neighbors and strangers for candy, I didn’t get a picture of Leah. She went trick-or-treating with a friend and was gone at picture time. 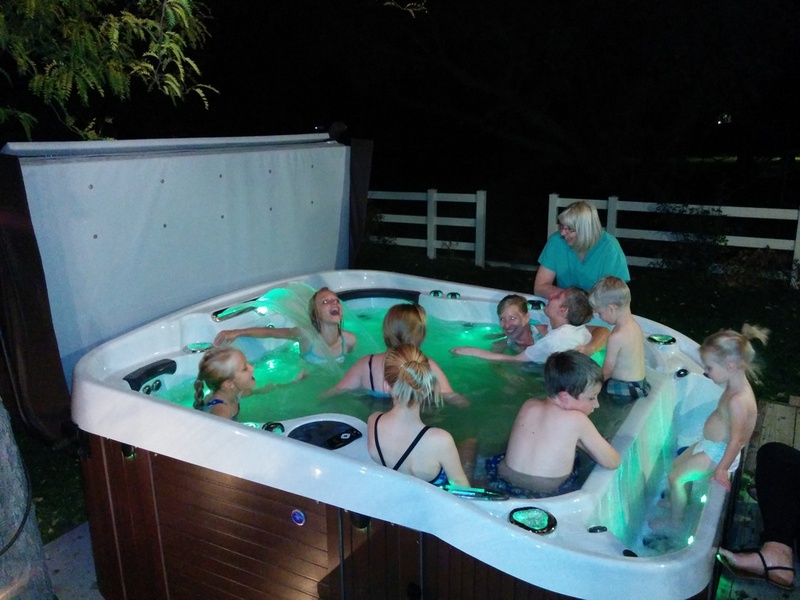 My sister got a hot tub recently and hosted a family party. It was Ammon’s first time in a hot tub and all indications were that he liked it. Not that he can really feel the heat on his paralyzed legs, but it was fun regardless. 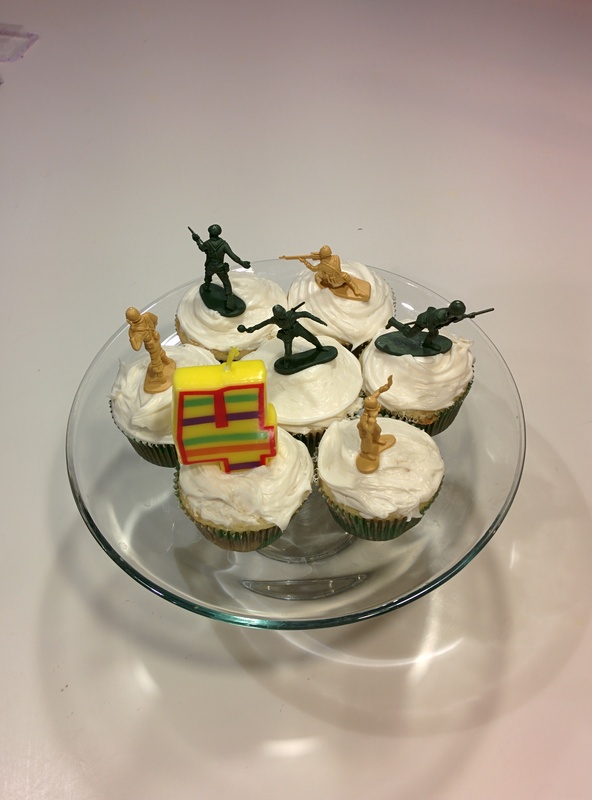 The World Series wrapped up recently and we had the euphoria of celebrating the victory of our favorite team. Both Jen and I lived in Northern California as kids (her in Sunnyvale and me in Sacramento) and we’ve followed the team since then. The crazy thing was that my brother, Adam, is a life-long Royals fan. I never honestly even considered the idea that our two teams would meet in the World Series. Exciting postseason. 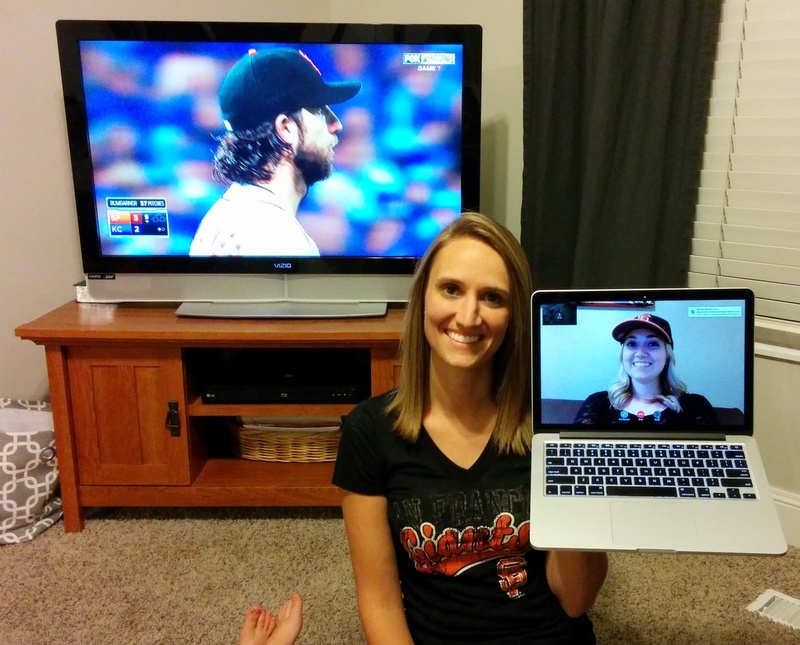 In the picture below, Jen’s sister (also a big Giants fan) was watching with us via Facetime. It was fun to enjoy the conclusion of the series together. I am currently “on detail” as the GIS Coordinator at the headquarters of the Uinta-Wasatch-Cache National Forest. That basically means I get to do a different job in a different location for three months, after which I’ll head back to my normal job. I now have to travel about 36 miles to work each day and go back and forth between driving and using public transportation (train / bus). I just happened to email the hydrologist a few days ago about some project ideas and said, “Hey, I’d like to go to the field with you.” It didn’t take long for him to find an excuse to get out. 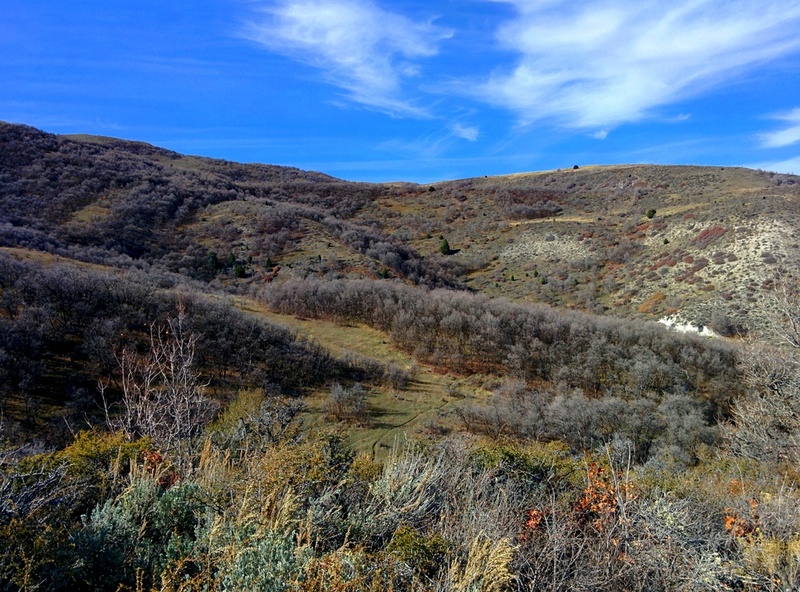 We drove from South Jordan up to the Wellsville Mountains west of Logan so we could check on the condition of a stream channel that has been impacted by cattle. It was a gorgeous day and made me happy. Finally, Abby (front row, third from the right) had a piano recital on Saturday immediately following her volleyball game. She played “All of Me” by Jon Schmidt and rocked it. She loves playing and had a knack for the instrument. Summer officially ends in a week when my kids go back to school (August 25). We’ve had a fun and busy summer and it felt like we haven’t been able to sit still for longer than a day or two. We didn’t go on any official “vacation” as an entire family this summer, but we tried. Jen and the kids have taken advantage of season Lagoon passes. 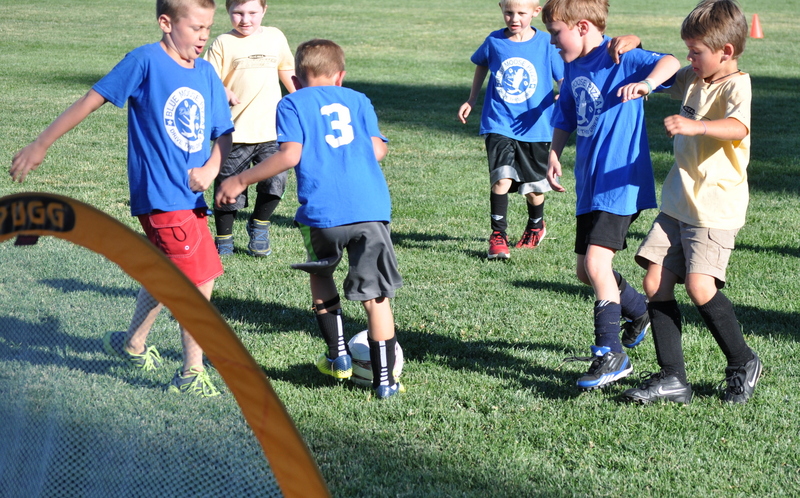 They’ve been a fun opportunity to go have great experiences with the kids. It’s a riot sitting next to Austin on a roller coaster and having him hold his hands in the air for the entire ride. We’ve been to Lagoon 12-15 times this summer (I’ve only been about 5 times … dang job). We went to Mackay, ID, for the 4th of July holiday. Then the very next week I began a series of three business trips in 5 weeks. I spent three days in the field gathering data for a project I’m doing. Two weeks later I spent the week in McCall, ID, on the Payette NF. Two weeks later, I flew to Portland and then drove the 110 miles south to Eugene for a meeting. While these were all great trips, the rapid timing of all makes things tough on me and the family back at home. I have no trips planned as of now. Abby celebrated her 11th birthday this week by getting sick. She actually threw up the morning of her birthday (like, 1am) but still felt well enough to open presents. One of the presents? Wicked tickets. See Abby’s reaction to getting the tickets below. We went to the BYU football scrimmage a week ago and then enjoyed a lunch with the team under the auspices of the “Thursday’s Heroes” program. After lunch we went around and took some pics with some players, including starting QB Taysom Hill from Pocatello, ID. Austin fell asleep (oddly) so we had Taysom sign his hat. When Austin woke up, he was a bit concerned that some “boy” wrote on his hat. 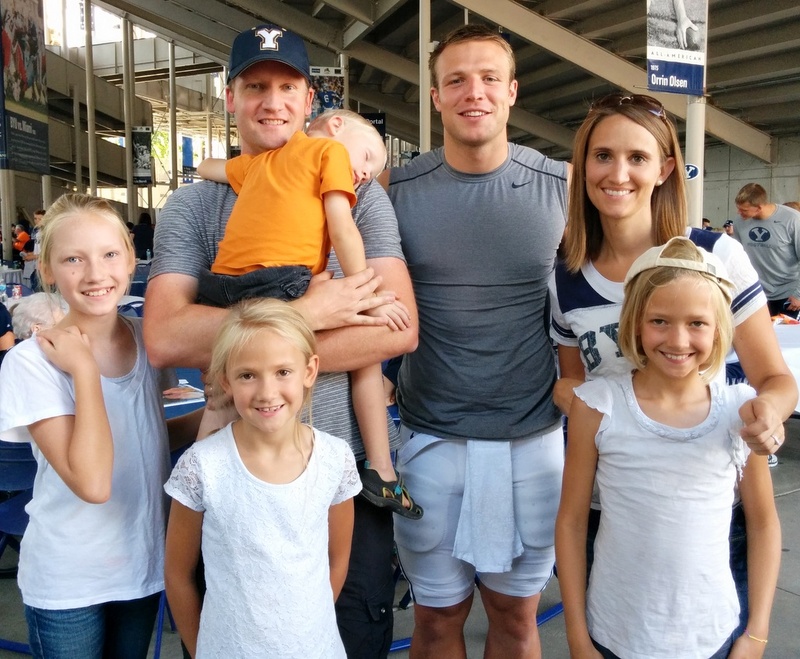 The family with Taysom Hill, QB. 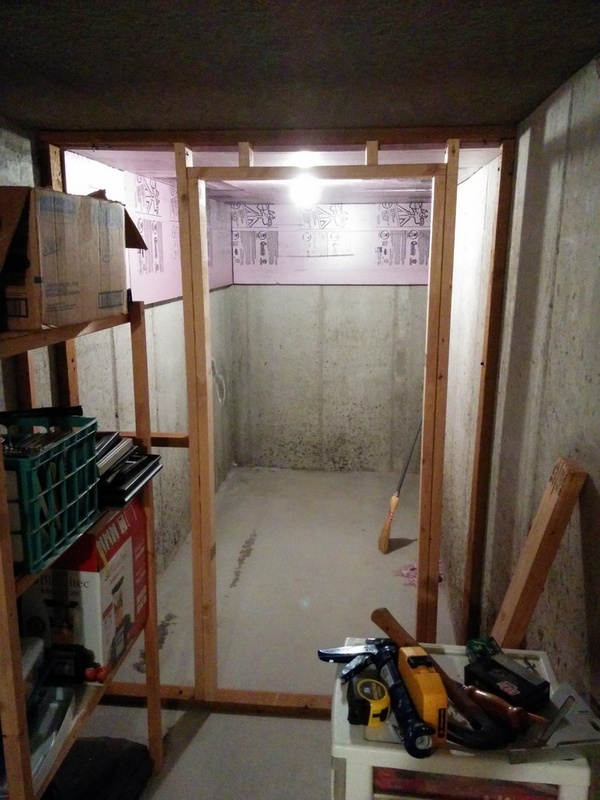 Finally, I’ve started a bit of construction in the basement. We have a large under-porch storage room that should be an ideal cold storage room. However, the entire room ceiling and about 2 feet of the outside wall is exposed to the sun, making it pretty susceptible to environmental influences. We decided to take the ten feet at the end of the room (the end that gets more shade and is a bit more temperature stable) and partition it off from the rest of the room. I used rigid foam insulation and stuck it to the walls and ceilings with liquid nails. Last night I framed in the wall that will hold insulation and a door. Once all that’s done, we’ll be able to free up some space in our main-level pantry because we eventually want to make that a mud room. Ah, it’s never done, is it? Always doing something to the house. Oh yeah, I still have a gutted bathroom on the second floor. Lame. 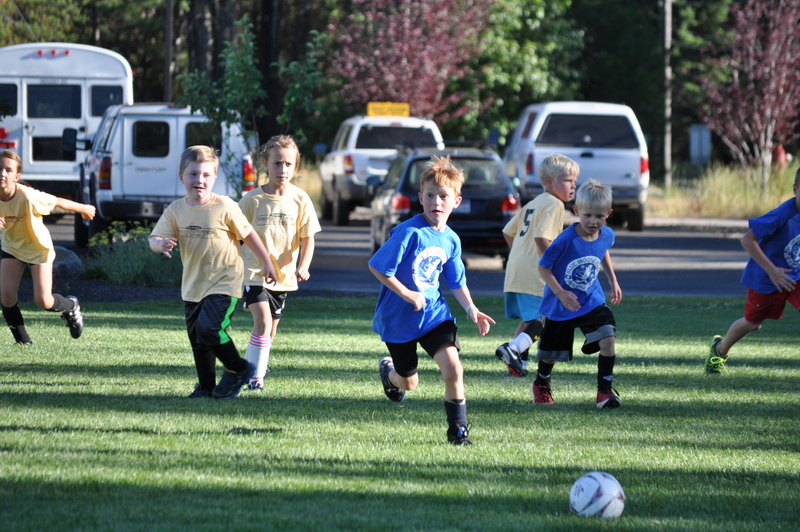 I had the cool opportunity to visit McCall, Idaho, this week. 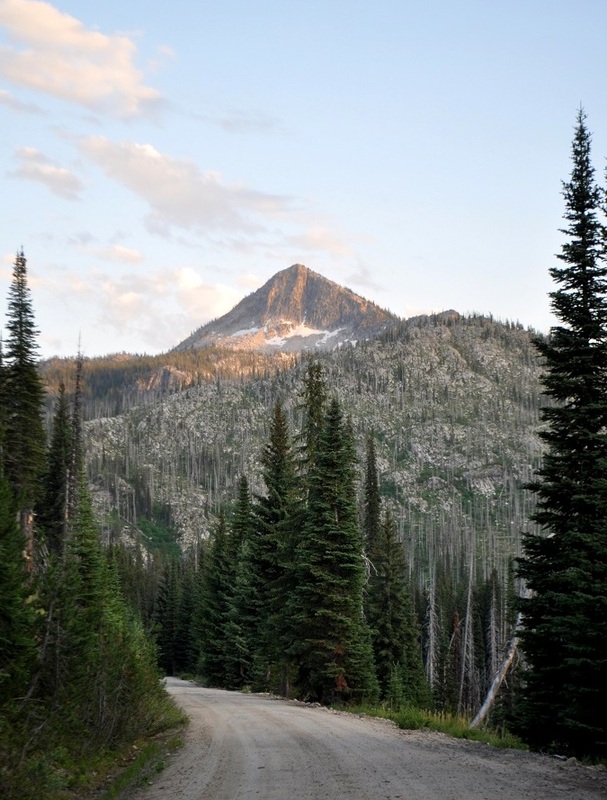 One of my former bosses is now the Forest Supervisor of the Payette NF, headquartered in McCall, and I spent the week shadowing various people (supervisor, district rangers, program leaders, staff officers) in their work. I was also the recipient of excellent and gracious hospitality from my former boss and his wife, who was also my co-worker 10 years ago. McCall is at the southern edge of Payette Lake and is very touristy — one of those towns that doubles in size during the summer. They have long, snowy winters, but man, the summer sure seems nice. We had a cold front flow through while I was there that brought the temps down to a high between 65 and 70 (low of 41). Seemed a bit cold to be swimming in the lake, but I saw plenty of people braving the temperatures. 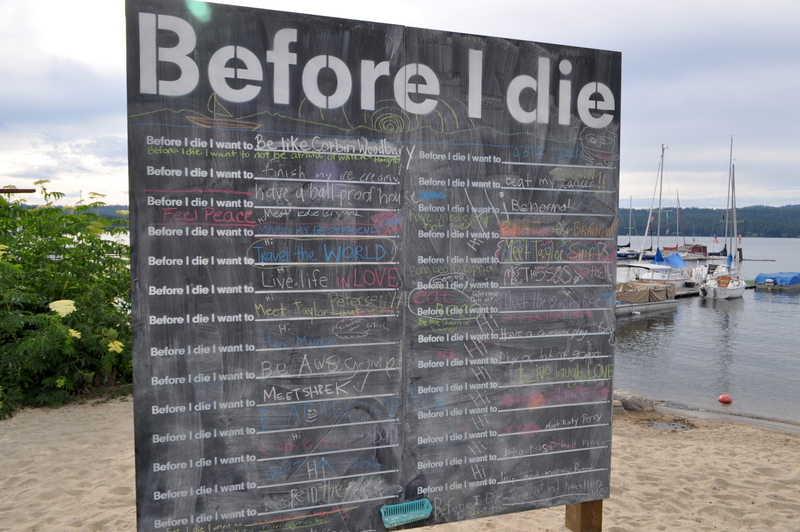 They also have this chalkboard on the beach where people can share their thoughts about their own bucket lists, I guess. 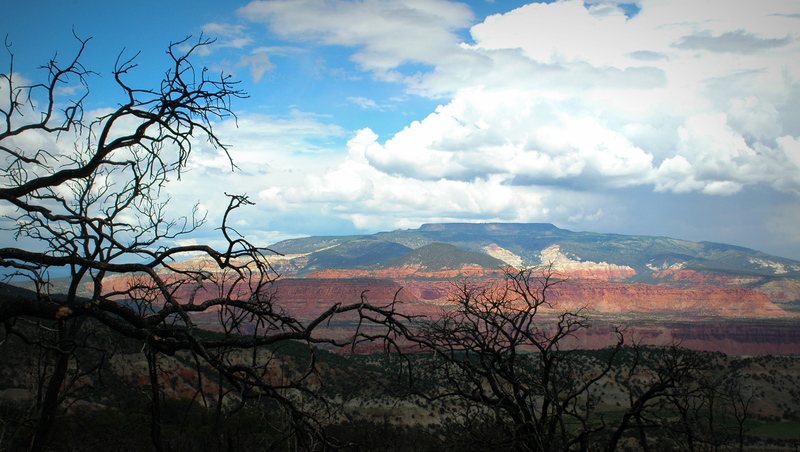 Keith and I took a drive up the Lick Creek drainage and were rewarded with some great vistas. 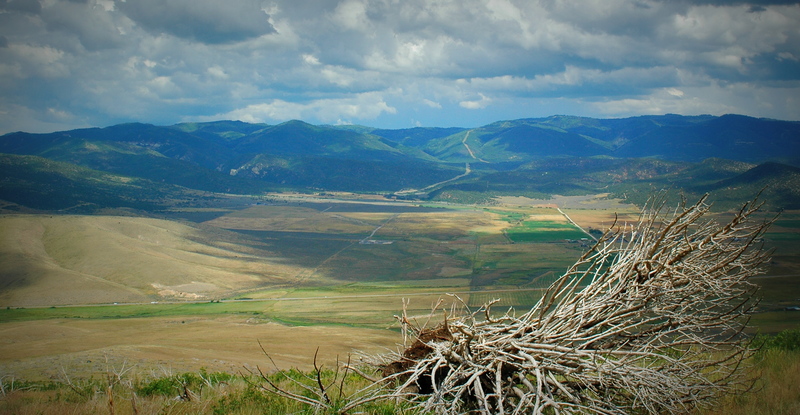 This area burned in 1994, which created some great open views of the mountains. 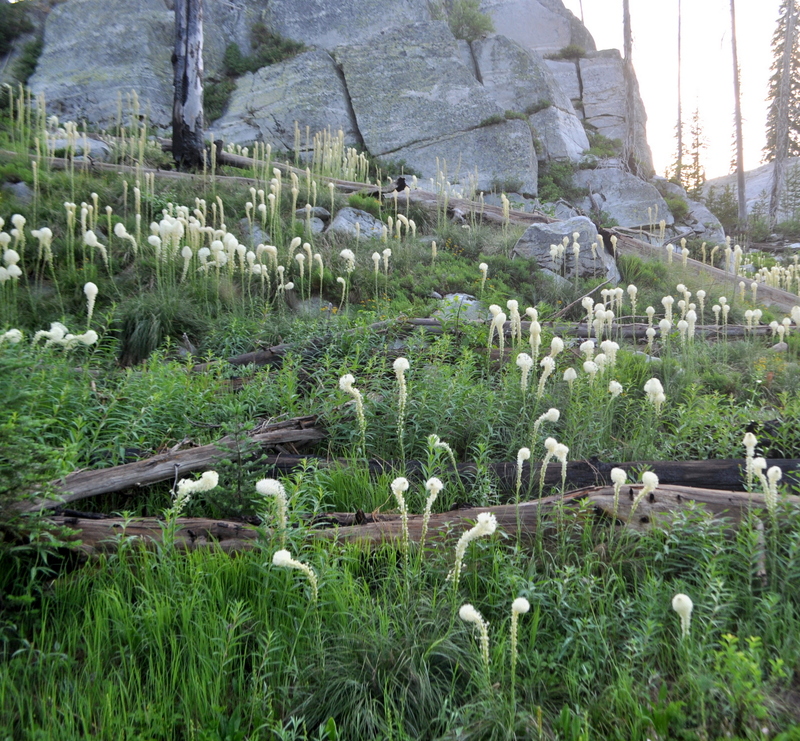 The white whispy plants are beargrass. 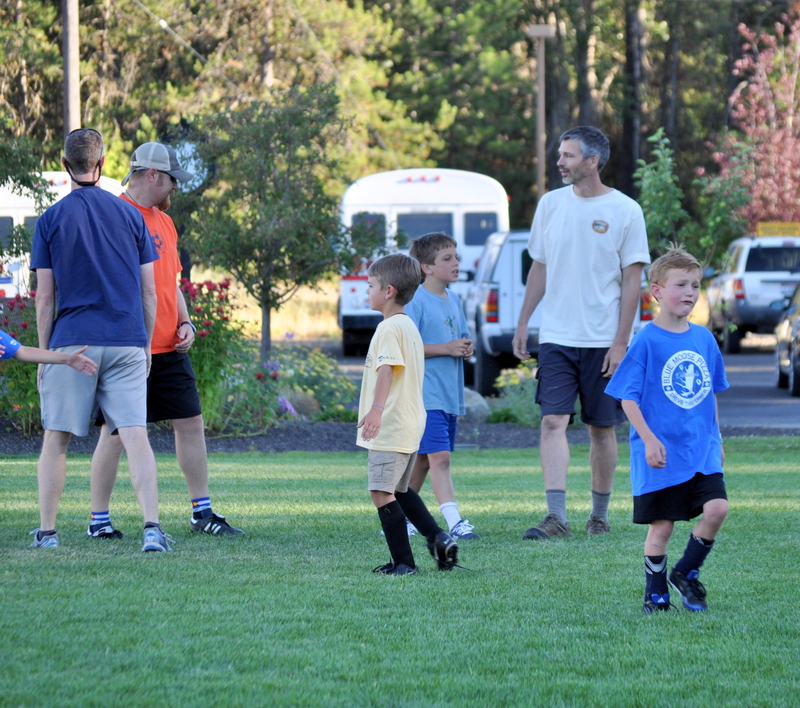 Keith and Karen have a 7-year-old son Bryce, who plays on a summer soccer league. Apparently, Keith has taught him the most important thing: elbow your opponents in the face when things aren’t going well. I guess that’s better than teaching him to bite his opponent, ala Luis Suarez. Unfortunately, the agony of defeat was just about all Bryce could handle. 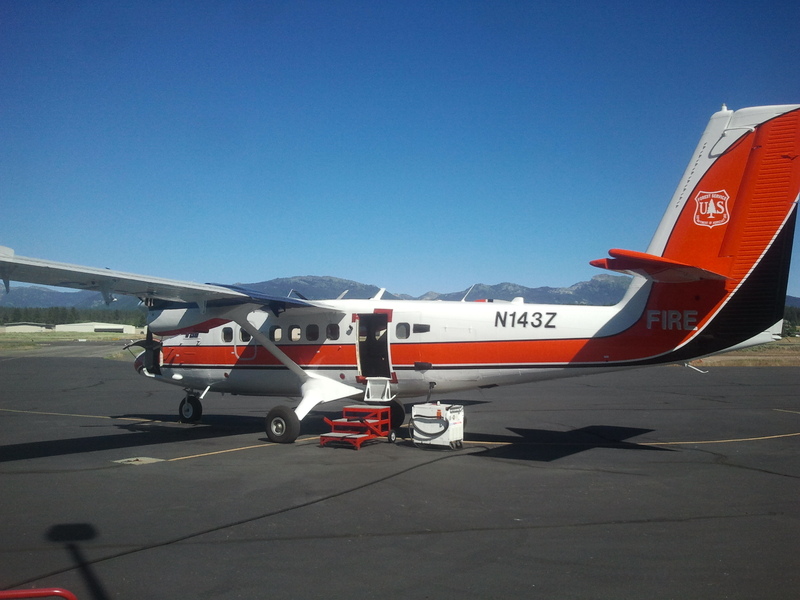 I spent two hours touring and meeting employees in the McCall Smokejumper Base. That was a cool experience. The work these people do is pretty awesome. 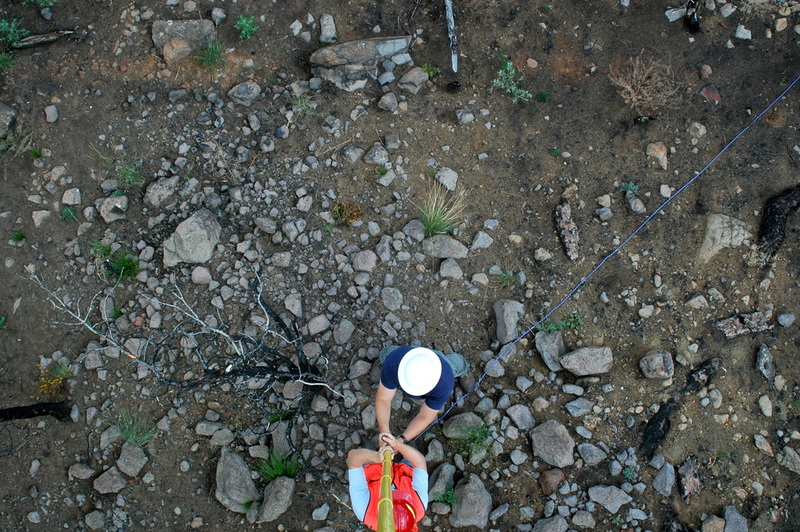 They get called out to the very early stages of some fires, get on a plane, and then parachute down to the mountain — with their gear (chainsaws, pulaskis, shovels, food, water, etc.) — and provide the early initial attack efforts on wildfires. Talk about a rush. 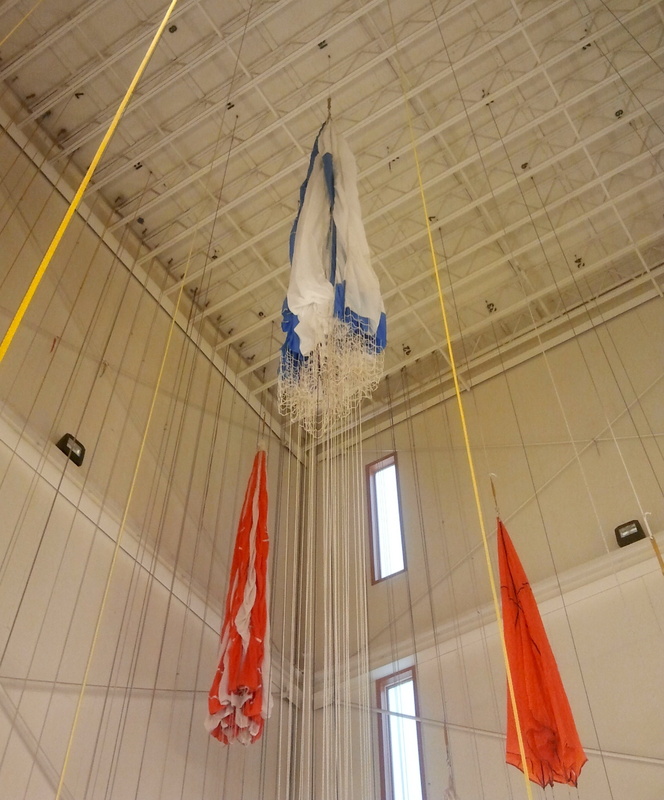 After each jump, the chutes are hung in this tower and inspected very carefully. If they find defects, they mend the chutes themselves to make them airworthy again. I’ve traveled for work over 50 times in the 12 years I’ve been a “professional.” Some of the trips were to far-off exotic places (Rome, Alaska, Brazil), some were to some pretty awesome US places (Boundary Waters, Washington, D.C.), and many have been somewhat benign (Albuquerque, Sioux Falls, etc.). About a third of those trips were “field” trips, where the objective was to actually work in the field gathering data, either for map validation or for training data for future modeling efforts. It’s not very often I get to work in the state in which I actually live: Utah! This week I took the opportunity to do just that. I’m working on an idea where we’d use remote sensing (satellite imagery) to model/predict the amount of vegetative cover present on a burn scar within a year or two or three of a fire occurring. The impetus of this project was a call from a hydrologist in Washington asking if I had any data to help them decide whether it was safe to open a campground at the base of a burned hillslope. The local forest gets pressure to open public land for public use, but the public rarely seems to consider the imminent danger posed by western thunderstorms and the repercussions of the sudden burst of water on a burned slope. I’ve now visited 8 burn scars, took photos of the recovering land, and am working on building a model that will use satellite imagery to accurately predict the amount of cover present, therefore giving land managers actual data to help with their decision making. This trip entailed a visit to the Clay Springs fire (between Oak City and Scipio), Lost Lake fire (on Boulder Mountain south of Teasdale), and the Wood Hollow fire (east of Fountain Green). This was the view we had all day on Thursday … working on Boulder Mountain while looking across the valley at the red rock and trees of Thousand Lake Mountain. There are worse places to be, that’s for sure. This was on the Wood Hollow Fire. They didn’t really burn much “timber” in the sense of large Ponderosa Pine or Doug Firs … mostly just juniper and cedar. 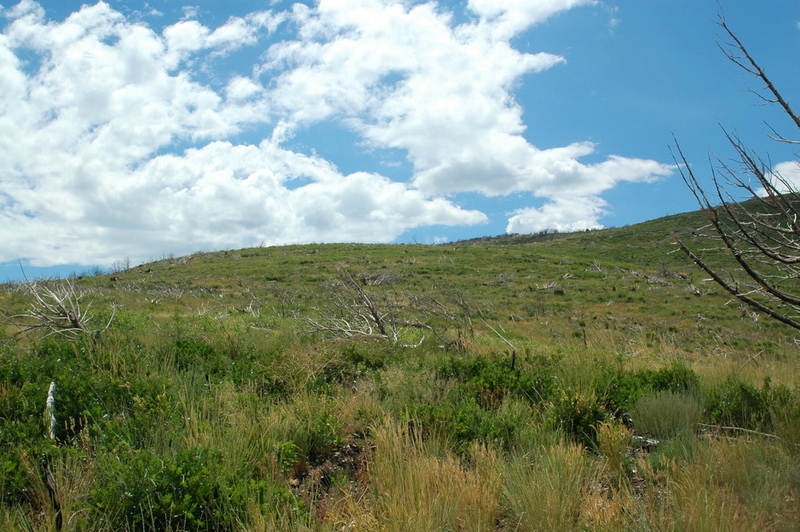 We came across entire hillslopes that previously held lots of juniper trees. They burned in the fire and must have experienced a good wind storm, because they were all knocked over. It was just weird enough that I kept on trying to figure out if they were mechanically knocked over, but there was no evidence of that. 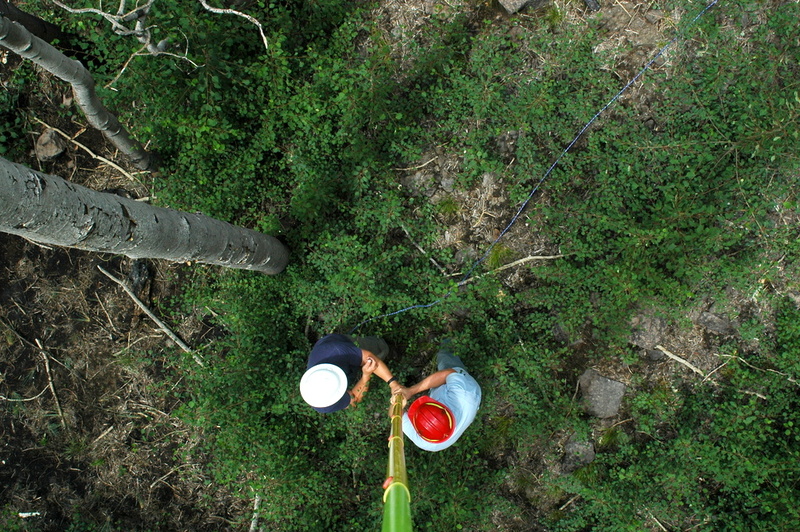 We put a camera on a telescoping monopod and put it up in the air 25 feet looking down at us. These photos will be interpreted and we’ll have a % cover present number for each photo. This plot, even two years later, had little activity present. This plot had a very active Aspen regeneration. None of these green trees existed in this form two years ago. Aspen frequently comes in after a fire and takes over the site for a number of years (like 20) until the conifers have time and opportunity to regenerate. This doesn’t always happen, of course, but is frequent. I’ve been to Washington, D.C. now four times, but this was the first time my wife has accompanied me. In my current role, I facilitate a steering committee who directs some of the program of work we perform at my office, and this committee is largely made up of people in leadership positions in the DC headquarters. Lucky for me, the headquarters of the Forest Service is literally on The Mall, directly across the street from the Washington Monument. I flew out to DC on Monday while Jen and Leah arrived on Wednesday. When my meetings ended on Thursday, we officially started partying. I look forward to returning next year. Anybody want to come next time? Pictures below! The “money shot” of this temple. Just not typically much of a money shot when captured with this kind of lighting.